The aim of this study was to introduce 5% up to 40% of low grade silicon carbide (LGSC), with construction excavated soil before the soil being reused as raw material in Eco brickmaking. Furthermore, stone sludge was added to mix with LGSC to fabricate eco bricks. The results indicated that the use of 10% granite sludge, 30% LGSC and 5% brick waste clinkers could produce grade-2 eco bricks in sintering temperature 1,050°c, however 30% granite sludge was substituted to obtain the same grade eco bricks. Water absorption of eco bricks has increased during the addition ratio of LGSC increased. However, the compressive strength increased while water absorption decreased during the operation temperature increased from 1,020°c. to 1,050°c. H. S. Gopala and K. Murthy, “Evolution and present status of silicon carbide slurry recovery in silicon wire sawing,” Resources Conservation and Recycling, vol. 104, Part. A, pp. 194-205, 2015. A. Bidiville, I. Neulist, K. Wasmer and C. Ballif, “Effect of debris on the silicon wafering for solar cells,” Solar Energy Materials and Solar Cells, vol. 95, no. 8, pp. 2490-2496, 2011. M. Lokeshwari M. and K.S. 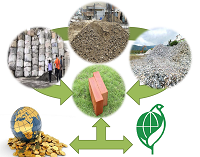 Jagadishb, “Eco-friendly use of granite fines waste in building blocks,” Procedia Environmental Sciences, vol. 35, pp. 618-623, 2016. M. J. Munir, S. M. S. Kazmi, Y.-F. Wu, A. Hanif, and M. U. A. Khan, “Thermally efficient fired clay bricks incorporating waste marble sludge: an industrial-scale study,” Journal of Cleaner Production, vol. 174, pp. 1122-1135, 2018. W. Li, G. Lei, Y. Xu, and Q. Huang, “The properties and formation mechanisms of eco-friendly brick building materials fabricated from low-silicon iron ore tailings,” Journal of Cleaner Production, vol. 204, pp. 685-692, 2018. A. O. Babatunde and Y. Q. Zhao, “Constructive approaches toward water treatment works sludge management: an international review of beneficial reuses,” Environmental Science & Technology, vol. 37, no. 2, pp. 129-164, 2007. I. Pundienė, A. Korjakins, J. Pranckevičienė, and M. Kligys, “Effect of silicon carbide aggregate, prepared by different methods, on the properties of refractory concrete with cenospheres,” Ceramics International, vol. 44, pp. 15944-15953, 2018. Q. Huang, and Z. Jin, “The high temperature oxidation behavior of reaction-bonded silicon carbide,” Journal of Materials Processing Technology, vol. 110, no. 2, pp. 142-145, 2001.